Overall good for the price. I had hoped I could just run one cable and connect it to the video port on both ends, but no dice. CONS: -Requires two Cat5e cables. Will not work with just one. Bought the 75' (pid 5906) and does a good job so far. PROS: Very easy to install, have multiples setup using this product. CONS: need very good ethernet STP cable if going beyond 50'. need two cables per setup that makes more wires to manage. I needed something to carry a DVI signal 150 ft to a church projector. This device seemed like a good idea You run two Cat5 cables in between the two converters and problem solved. The biggest and most important complaint is the life on these. The first purchase was in 2010 and it almost lasted 2 years. Outside of the warranty, I had to buy a new one in 2012. It lasted 1 year and failed. I was sent a replacement that failed after 9 months...very frustrating and disappointing. I may buy items from this company again, but nothing electronic. Quality is horrible! CONS: Very short life span! Works flawlessly. I'm using it to drive an LCD projector from a Mac Mini (2010) using a mini-DisplayPort to DVI adapter, with 100 foot Cat 5E cables. We are please with the results from this product. 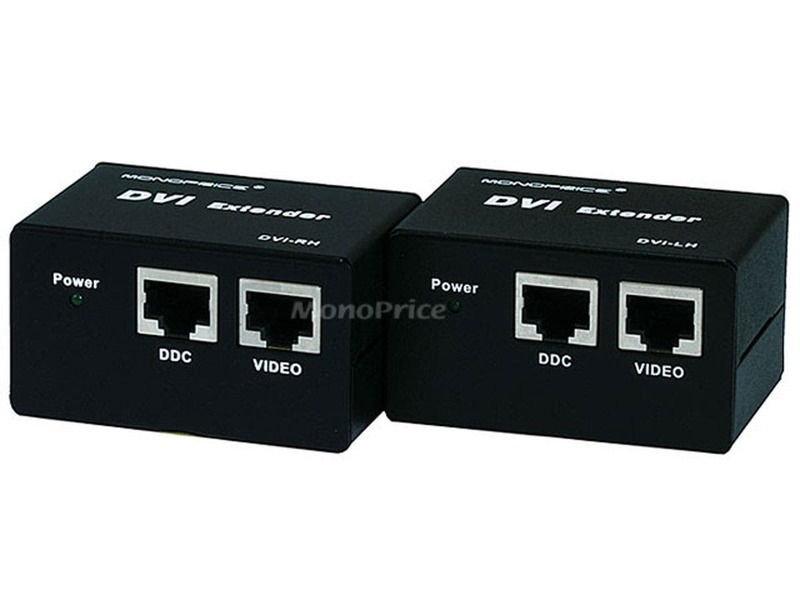 The cable runs are at about 100' using shielded CAT6 cable to view DVI video from a PC to a LCD flat panel television 1080p HDMI input. Works great! Ran the Cat5e cable 50 feet(not meters) and no problems. I even used a DVI-to-HDMI cable(purchased from Monoprice) to connect to a Samsung TV(32") and it works perfectly! The computer sees it as a second monitor with a resolution of 1920x1080. Great, and for much less! This unit works perfectly, at a substantially lower cost than those from Gefen. Wish I'd found Monoprice sooner! 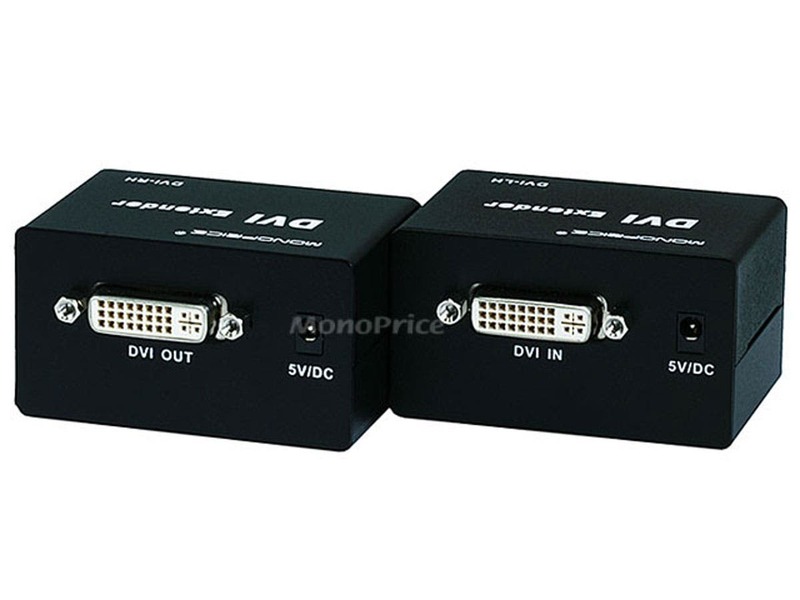 Have used these to send DVI signals to video walls when the player/source is not colocated with displays. PROS: Works as promissed, great cost. CONS: If the powersupply fails and is plugged in to the receiver, it does not pass the power down the Cat5 cables (Video and DDC ports). Product is not smart enought to go into a bypass mode in the even of powersupply failure. 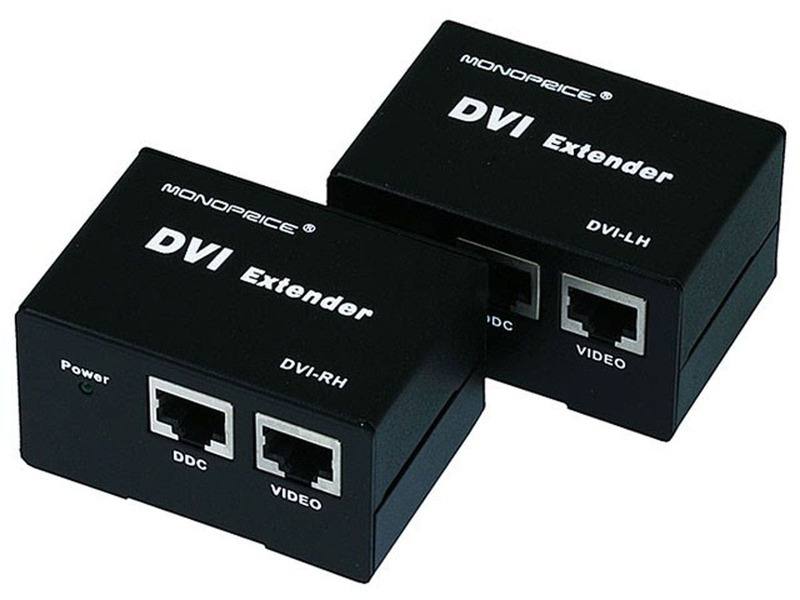 Connected xmitter to receiver w 60m of Cat6 cables (greater distance than specified) and then played a copy-protected BluRay disc on a Panasonic BluRay player through this extender (via HDMI to DVI adapter cables) to an HDMI monitor. No problems encountered. CONS: Can't power from either end. Just a warning, unfortunately the description doesn't explain it very well but this unit requires that both the DDC and HDCP cat-5 cables be plugged in for the unit to work. 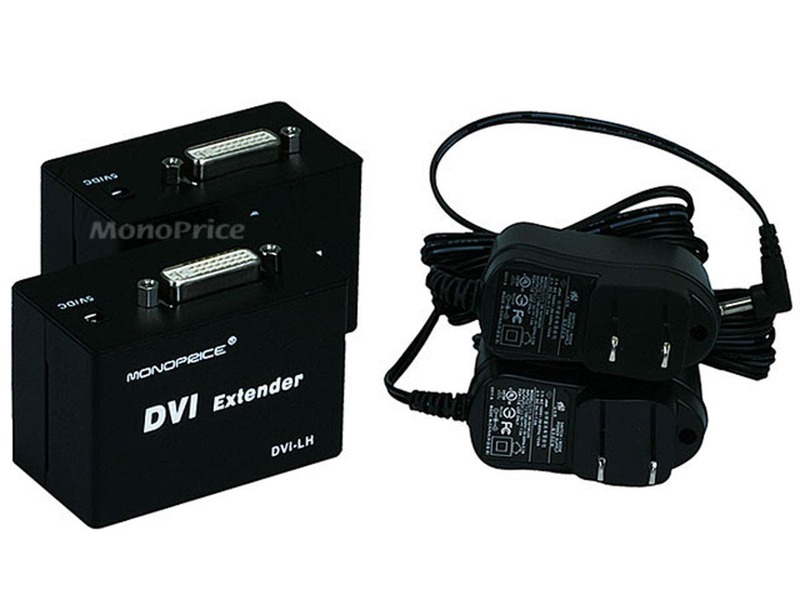 Originally I thought that the 2nd wire was optional and that it would work with only one (without HDCP support) like the other dvi extender but found out it wasn't the case and had to do an emergency order of another cable. PROS: Works very cleanly, no visible lag. CONS: REQUIRES both wires to be plugged in.